The bulls are running again. Last Wednesday, spooked by a stream of negative headlines regarding the Trump White House and rising impeachment odds, the Dow Jones Industrial Average lost 1.8 percent in what was its largest one-day selloff since September. At the time, it looked like the "Trump-flation" trade was suffering a catastrophic end. That volatility was returning. And that the persistent decline in market breadth and economic data was going to pull stock prices even lower. Instead, stocks are rallying for a sixth straight day and the Dow has climbed above 21,000 while the S&P 500 is on track for another closing record. Here's why it's too soon to sound the all clear. 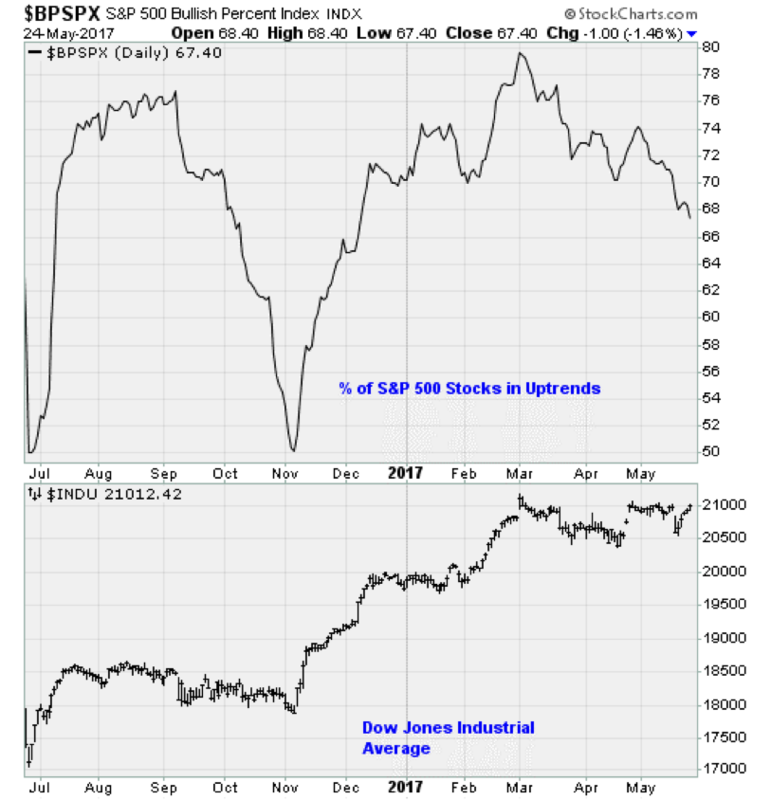 For one thing, as shown below, breadth is weakening as buyers use fewer and fewer stocks to hold the market aloft: From a high near 80 percent, the percentage of S&P 500 stocks in uptrends has fallen to just 67 percent. That's a sign of vulnerability and waning buying interest. Outside of frenetic buying of select big-tech stocks, buyers are rejecting a growing list of stocks. For every Amazon (AMZN) and Apple (AAPL), there is an HP (HPQ) or Tiffany & Co. (TIF) that is struggling. And besides, as shown below, the scramble into big-tech stocks is getting pretty silly: Tech inflows have reached the highest level in 15 years. The economic data continue to disappoint on a scale not seen since late 2015. Yet the Federal Reserve is sounding surprisingly hawkish, all but assuring another quarter-point rate hike for its June policy meeting (futures market odds are north of 80 percent). The Fed's latest meeting minutes, released Wednesday, talked up action on cutting down its $4 trillion balance sheet (up from around $800 billion before the recession) sooner rather than later. We are talking a reversal of quantitative easing here; which has been, globally, responsible for the surge in financial asset prices across the board and is still going strong in Japan and Europe. Politically, the media's blitz against Trump has only calmed this week because he left the country. Watch for the FBI-Russia story to return in full force when former FBI Director James Comey appears in front of Congress next week. The more this story plays on, the less likely it is that Trump will be able to push through the legislative agenda — tax cuts, health care reform and infrastructure spending — that boosted stocks after Election Day in the first place. History isn't on the side of the bulls here either. Jason Goepfert at SentimenTrader notes that we've just witnessed one of the quickest recoveries from a "shock loss" day. Yet, in the past, rapid recoveries like this haven't persisted, with a negative risk/reward over the weeks that followed. Only four out of 11 times did stocks add to their gains; and the risk-vs.-reward ratio was skewed nearly 2-to-1 to the downside. There's more: The S&P 500 has rallied five days straight to a new multi-year high during the month of May 10 times in the past. In those cases, it was higher 30 days later only twice, with an average return of -1.7 percent.